For all bento friends, you can still join this event. The entry will be closed on Wednesday, 31 March 2010. So quick ... submit your entry via e-mail. Read carefully on how to enter at Japan Society's website. Inside the box : flat pork meat balls with carrots, chikuwa stuffed with lady fingers, broccoli, raspberries, and small orange. Adorable Lia, I like all the tiny flowers, cute hair, okra and bright colors! Is it Shinkansen hashi? I just found a pair myself today, yay! Cute children bento! Even when you're so busy yet you can still come out with such nice bento! Did you do the orange color egg sheet for the leafs too? another cheery looking creation. wish you good luck for the event! @sherimiya : Thanks a lot Sheri! You have a sharp eyes ... that is Shinkansen hashi. It comes with the box too, cool for the boy although my girl will not refuse it too. Lia this is so beautiful! I love the different textures of the egg sheet! Wonderful entry into the contest!!! Just found your blog through flickr!! You are so talented and your children are lucky!! ^_^ Love the details in this bento. Is that a kappa toothpick? Kawaii. beautiful job lia! i actually really like the textured egg sheet, i thought you did it that way on purpose! the sakura and petals are so pretty and delicate, and i like the okra (never heard it called lady fingers before, what a cute name!) inside the chikuwa too. great contest entry, good luck in the competition! What a great job done Lia! The wrinkle egg sheet actually look very nice! I like all the little flowers on the kimono so much! 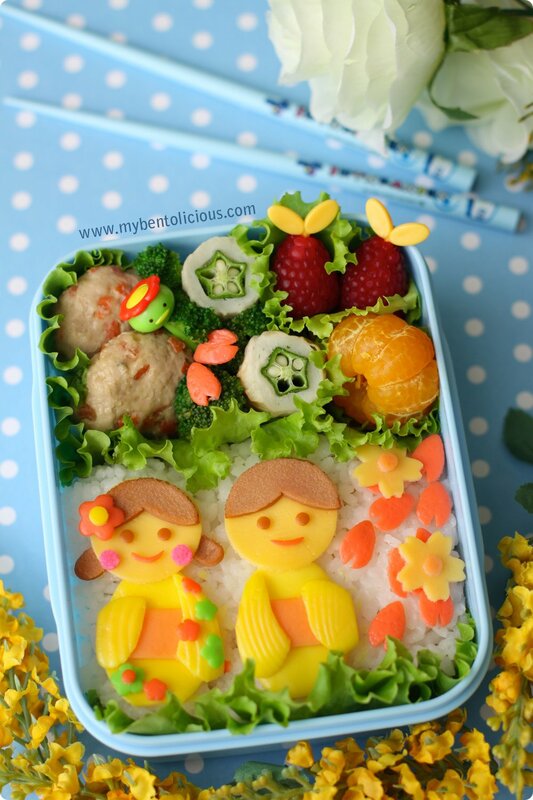 Lovely cute bento, which has definetely its place in the contest. I hardly ever participate in contests, by lack of talent mainly but also because I always fail to come up with something nice before the deadline. I like the wrinkled eggsheet, like Megan, I thought it was done on purpose. And thanks for the tip for the flat eggsheet. I'll try with starch and water and see how it goes. @Ceinwyn/Ingrid : Thanks a lot Ingrid! Yes, you can have fun with the colored egg sheets. Please try it! You are so good in making your yummy bento so don't feel that your talent less from everyone else. Ganbatte!! What a beautiful accident on the wrinkle egg. I can't imagine creating such art out of egg! I like how you tuck everything right into place! I have your blog button on my blog! I thought I was following you, but for some reason it didn't. Oops! So I have fallen behind on your blog and bentos! Sorry!